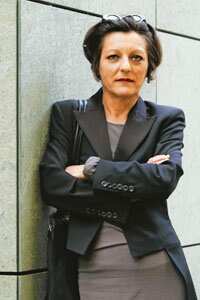 Berlin: Herta Mueller, a Romanian-born writer who escaped Nicolae Ceausescu’s police state two years before the Berlin Wall fell and has become one of reunified Germany’s best known novelists, has won the 2009 Nobel Prize in literature. “With the concentration of poetry and the frankness of prose," 56-year-old Mueller “depicts the landscape of the dispossessed," the Swedish Academy said on Thursday on its website. “She’s not only a great artist with words, she really has something to tell," Peter Englund, the academy’s permanent secretary, told reporters in Stockholm. “She was really happy to receive the call, but she said it felt almost unreal." Her first work, Lowlands (Niederungen), which was published in censored form in Romania in 1982, details the brutally conformist life of rural Swabian Germans in Romania’s Banat region, where Mueller grew up. Complete versions had to be smuggled out of the country. Her work was lauded in Germany, while in Romania she was pilloried by the national press and the Ceausescu government banned her from publishing. The writer left Romania for West Germany in 1987 with her husband, Richard Wagner, two years before Ceausescu’s regime was overthrown. In the last two decades Mueller has had lectureships at German universities and has continued writing. This year, she published Atemschaukel, a novel about a German-speaking Romanian youth at a deportation centre at the end of World War II. The book, shortlisted for the German Book Prize to be awarded 12 October, succeeds in exposing the persecution of German-Romanians under Stalin through a highly individual story, according to Mueller’s publisher, Carl Hanser Verlag in Munich. Mueller’s mother was deported to the Soviet Union after the war and spent five years in a Ukrainian work camp. Her father served during the war with the Nazis’ Waffen SS. She is the first German to win the prize since 1999, when it was awarded to Guenter Grass. Last year’s literature prize went to French novelist Jean Marie Gustave Le Clezio, who wrote about exotic and endangered cultures in some of the world’s most outlying regions. Winners in the last decade have included British writers Doris Lessing in 2007 and Harold Pinter in 2005 and J.M. Coetzee of South Africa in 2003. The 10 million-krona ($1.44 million) Nobel literature prize was created in the will of Alfred Nobel and first awarded in 1901.